Is It More Common to Rent or Own in Each State? A yard, a few tax breaks, the ability to replace that outdated green and yellow tile in your bathroom—all reasons to buy a home. But there are plenty of reasons to continue to rent, too. In the short run, it’s easier on the pocketbook (since you don’t have to make a five-figure down payment upfront). It relieves you from the burden of managing maintenance and repairs. And, if you’re looking to live in the heart of the Big Apple, it may be your only realistic option. Every state in America has more owner-occupied homes than residences filled with renters, but some states are more evenly split than others. We dug up the stats to see where Americans are choosing to buy versus rent—and how much it costs them each month to keep a roof over their heads. Learn more about how we calculated our rankings in our methodology section. Maine’s average monthly rent of $1,850 seems astronomically high compared to a $1,175 monthly mortgage payment. That, along with state gems like Acadia National Park and some of the country’s best lobster, is reason enough to put a downpayment on a pad up north. West Virginia’s housing costs make us want to become Mountaineers. In fact, West Virginia has the lowest average mortgage payment of any state at just $778 per month. That’s also $222 less than its average monthly rent. We’re big fans of Iowa’s average $895 monthly mortgage—it’s one of the lowest average mortgage payments on our list. To put things in perspective, Missouri has the lowest average rent ($985) of any US state, yet Missouri renters still pay nearly $100 more per month, on average, than Iowa homeowners. Like most of the states on our list with high percentages of owner-occupied homes, Minnesota’s average mortgage cost is less than its average rent—$263 less, to be exact. In fact, even though Minnesota’s average monthly mortgage is on the higher end of housing costs in the US, it’s still cheaper than the average rent in most states. For example, North Carolina’s average rent is $1,300 compared to Minnesota’s average mortgage of $1,287. If a mortgage under $900 isn’t reason enough to consider landing in Michigan, we don’t know what is. Michigan’s monthly average mortgage payment is—wait for it—less than the cost of an iPhone (and $257 cheaper than its average monthly rent). Delaware’s average mortgage ($1,372) is less than its average rent cost—but only by twenty-eight dollars. It’s a small difference, but we’ll take a monthly mortgage payment that’s cheaper than a monthly rent check any day. We’re not complaining about Wyoming’s $1,025 average monthly rent—and the state’s average monthly mortgage of only $1,200 isn’t too shabby, either. With home payments less than the rent of some two-bedroom apartments in many cities, there’s one reason to check out Wyoming. Utah has affordable real estate (though it’s getting more expensive each year) and lots of land to build on, so it’s easy to see why the state ranks high for those looking to put down roots. With an average mortgage cost that is $306 cheaper than that of its next-door neighbor Colorado, it’s worth considering a one-way plane ticket to Utah next time you plan a ski trip. New Hampshire has a 70-to-30 ratio of owner- to renter-occupied housing units, despite the fact that the state’s average mortgage cost is $266 higher than the average monthly rent check. Out of all fifty states, New Hampshire is one of ten where the average mortgage payment exceeds the average monthly rent. Potatoes and Sun Valley aren’t the only reasons to think about heading over to Idaho. With an average monthly mortgage of just $1,428—only $138 more than the state’s already-low average rent—owning a home in the 208 is certainly feasible. New York is home to the rental mecca that is New York City, so it’s no wonder the Empire State has the lowest percentage of owner-occupied homes of any US state. New York is the only state with an average rent that exceeds $3,000. That’s nearly twice as much per month as the average mortgage payment of $1,829. Our guess: space in the Big Apple is limited—and the large number of renters drives up prices in the concrete jungle. If you’ve ever watched House Hunters, you know that California is an expensive place to live—period. And it isn’t just expensive—its cities also dominate the list of competitive places to buy a home. Prime Golden State real estate in cities like San Diego, San Francisco, and Los Angeles likely contributes to the nearly even split of rented units and owner-occupied units. Nevada’s percentage of owner- and renter-occupied homes splits nearly fifty-fifty (57% to 43%, to be exact)—and its average rent is only thirty-one bucks less than its average mortgage. Either way, you’ll pay a high price to live in the Silver State. If you live in Nevada, hitting the casinos to cover your housing costs might not seem like such a bad idea. At 59%, Hawaii has a higher percentage of owner-occupied units than New York, California, and Nevada—plus a higher average monthly mortgage. The Aloha State is also an expensive place to rent. To put it in perspective, the average cost to rent in the 808 is more than Pennsylvania and North Carolina’s mortgage costs combined. Rhode Island has a lot going for it (hello, quaint coastal towns), but affordable housing is not one of them. In fact, rent in the smallest state is almost $600 more than in the largest state (a.k.a. Texas). Everything is bigger in Texas—including housing costs. With an average rent of $1,525 and an average mortgage of $1,340, the Lone Star State has an average rent and mortgage fairly in line with each other. In Texas, it’s pricey to be a renter and an owner. Massachusetts’s $2,700 average monthly rent comes at no surprise with Boston and Cambridge in the mix. Its average monthly mortgage of $2,114 isn’t much better. Like Rhode Island, the Bay State proves that living in New England isn’t a cheap endeavor. Like the Northeast, living in the Northwest costs a pretty penny—and Washington is no exception. With an average rent of almost $2,000 per month, Washington even beats out Oregon (the next state on our list). Like Washington, Oregon’s housing costs are sky high. The state’s average mortgage and rental rates are both in the $1,700s, proving that living on the coast is pricey no matter your method of housing. 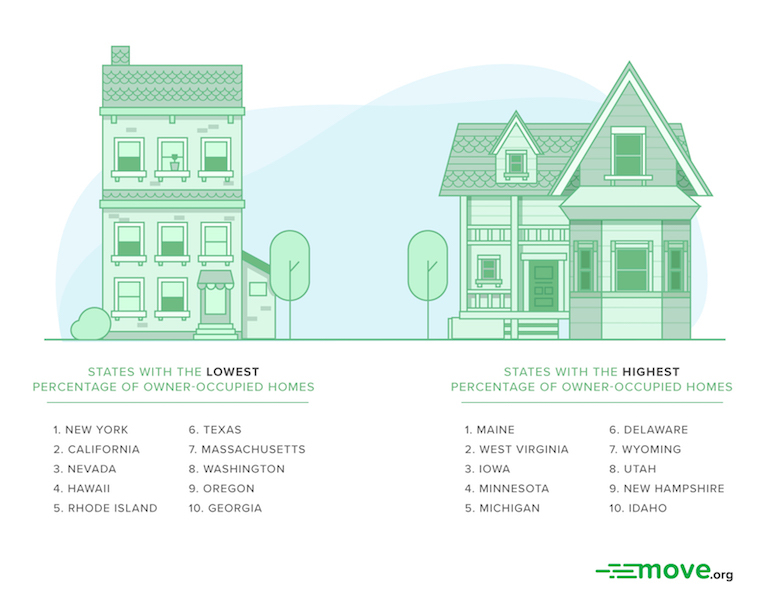 Surprised to see that Georgia made the list of states with low percentages of owner-occupied homes? Us too. Turns out rental leases prevail over property deeds in the Peach State. That said, Georgia’s $159 difference between its average monthly rent and its average monthly mortgage is fairly small compared to other states with low owner-occupied percentages. Only Oregon, Nevada, and Texas have tighter margins. Thinking of renting or buying? Use our Find-a-Mover tool to get the ball rolling on your next move! To determine which states have the highest percentage of owner-occupied homes, Move.org looked at the US Census Bureau’s 2017 American Community Survey. We compared each state’s percentage of owner-occupied housing units to the percentage of renter-occupied housing units. The US Census Bureau defines owner-occupied housing units as units in which the property owner or co-owner reside. Renter-occupied housing units, on the other hand, are not occupied by the property owner. This category includes renters as well as properties occupied by friends or relatives of the owner, caretakers, and other service providers. Although we didn’t include additional data in our ranking criteria, we also looked at each state’s average monthly rent, average monthly mortgage, and total number of occupied housing units. We compiled each state’s average rent and mortgage costs using data from GoBankingRates. Average monthly mortgage costs assume a 20% down payment with a 30-year fixed loan.